Litens Automotive Group is the global leader in the design and manufacture of engineered power transmission system design and components. A tier 1 supplier to the automotive industry, Litens invented the first mass-supplied automatic tensioner/single belt accessory drive 30 years ago and has maintained its market leadership position by continuously developing innovative products that solve vehicle performance and noise, vibration, and harshness (NVH) challenges. Serving a wide customer base, the company enjoys a majority market share, including all major international original equipment manufacturers (OEMs). According to Dr. Steve Jia, Chief Engineer, CAE Technologies and Materials Engineering, development of Litens products requires the design of sophisticated assemblies with complex contact relationships. “The nature of our products makes modeling and virtual product development very challenging,” Dr. Jia says. Litens began using the SOLIDWORKS® 3D CAD system in 1998 to facilitate 3D design modeling but needed a robust yet intuitive finite element analysis (FEA) solution for simulating, validating, and optimizing product performance. “Our work demands an analysis solution that can handle complicated contact analysis easily, quickly, and effectively,” Dr. Jia explains. “Litens products are generally small in physical size but involve assemblies with very complicated contact relationships between components. Using SOLIDWORKS Simulation Premium software, Litens engineers can conduct very complicated contact analyses—as well as kinematics, dynamics, fatigue, displacement, and thermal simulations—directly within the SOLIDWORKS design environment. This capability enables Litens engineers to quickly apply simulation results as they design, which saves time and allows engineers to optimize designs early in the process. “SOLIDWORKS Simulation Premium provides the best integration of CAD and CAE tools among all the CAE software that we have tested,” Dr. Jia notes. “There’s no need to import or export geometry. Single mouse-click switching between a fully functional CAD environment and a fully functional CAE platform makes the CAD/CAE integration perfectly smooth, truly efficient, and really easy. In addition to saving time due to CAD integration, Litens engineers can solve even the extremely complex contact problems in a matter of hours as opposed to the days such problems can take in other analysis systems. The combination of the software’s fast and robust solver and complete CAD/CAE integration helps Litens speed up its Transmission System Design process. Litens Automotive Group engineers perform a wide range of part and assembly analyses, including complicated contact, stress, displacement, dynamics, kinematics, fatigue, and thermal analyses. Simulate the performance of sophisticated assemblies involving complex contact effects during product design to optimize performance, minimize expensive prototyping cycles, and save time and money. 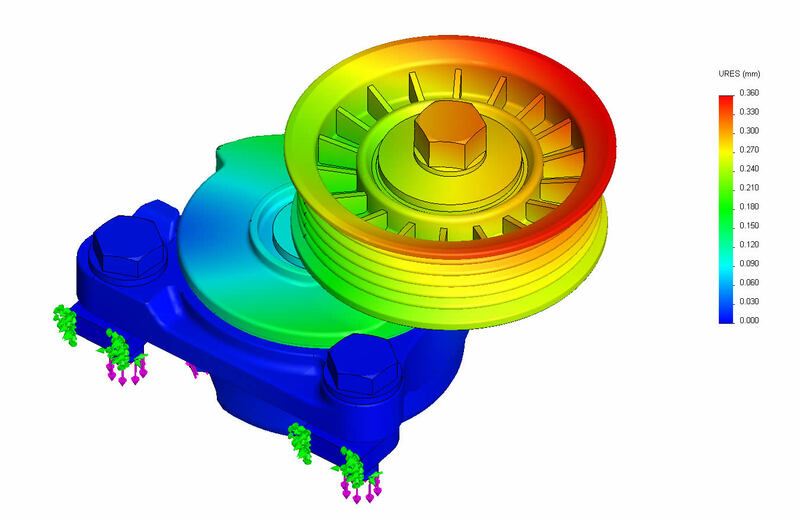 Implement integrated SOLIDWORKS Simulation Premium analysis software to conduct complicated contact, stress, displacement, dynamics, kinematics, fatigue, and thermal analyses during initial design.